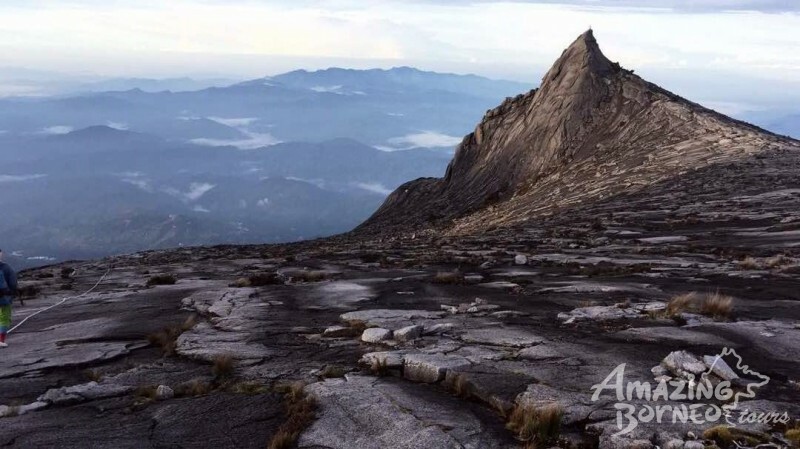 Mount Kinabalu is known as the highest mountain in Malaysia. Standing at 4095.2 metres above sea level, it is one of the few mountains you can climb without any prior mountain-climbing experiences. Anyone in good health can make an attempt to reach the summit however, that doesn’t make it an easy climb! 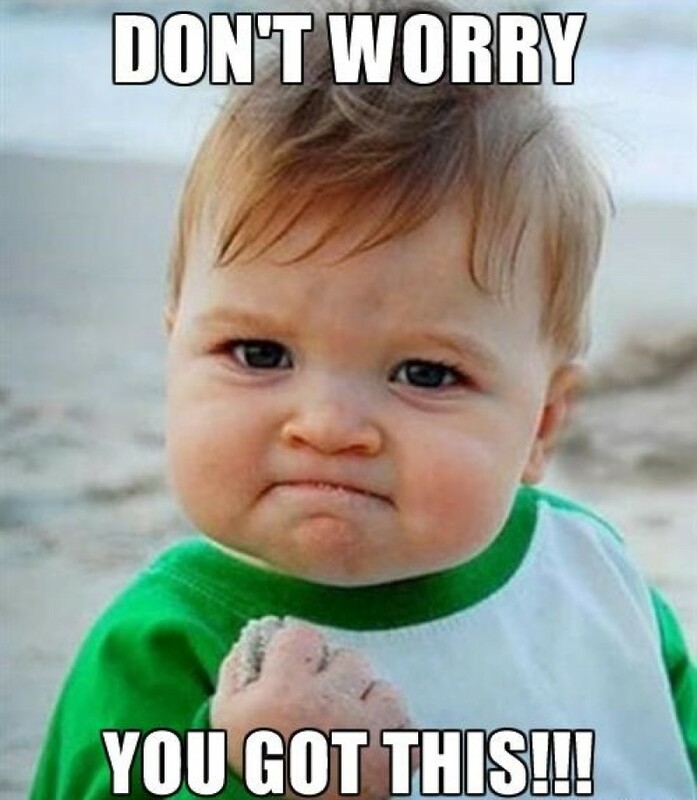 A lot of endurance and mental strength is needed to make it to the top within the cut-off time. 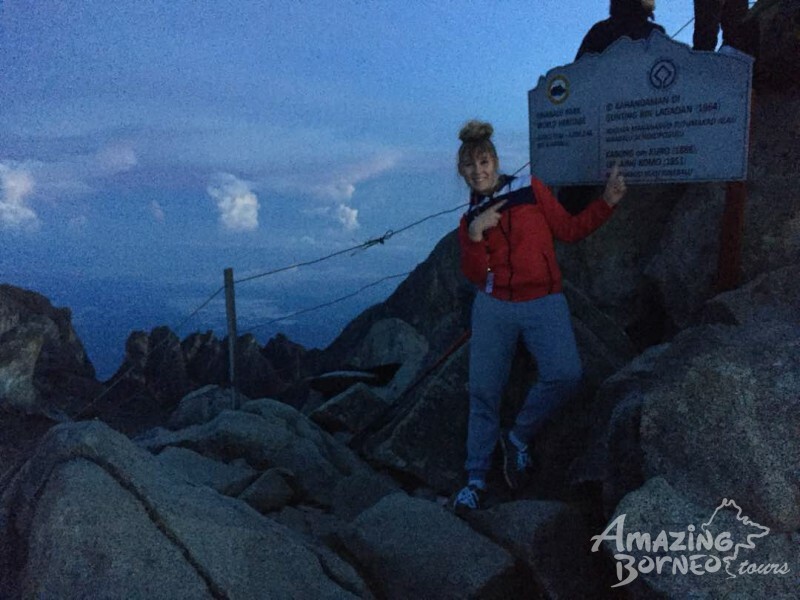 I booked a #GetLucky Mount Kinabalu Climb on Book.MountKinabalu.com in which solo travellers or a small group of people can meet fellow travellers and summit together with a shared mountain guide. 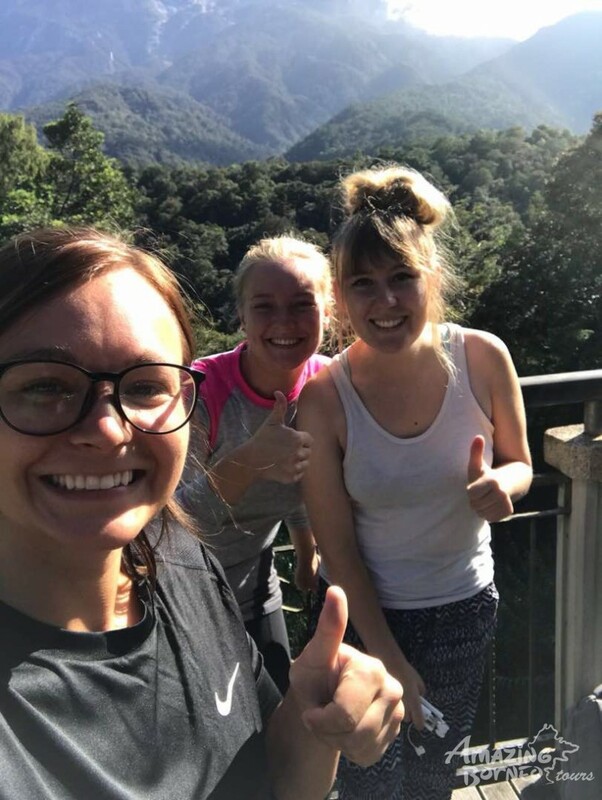 Our journey started at 6AM in Kota Kinabalu where we were picked up by an Amazing Borneo vehicle followed by a 2 and a half hour drive up to the Kinabalu Park Headquarters. Once there, we registered and were given tags to identify which tour group we were in. They also passed us our lunch boxes. Compulsory climb permit which you get to keep after your climb for as a momento! The two hours’ drive through Sabah’s magnificent landscapes was the great time to get to know the one other. I met two girls with whom I ended up doing the whole climb with. You may rent a walking stick at the Kinabalu Park Headquarters (RM10) which can be very useful to take some pressure off your knees, especially on the second day on the way back down. When everyone was ready, we were brought to the starting point where we were given a short briefing and some additional information about the trail as well as the do’s and don’ts during our climb. How long was the trail again? 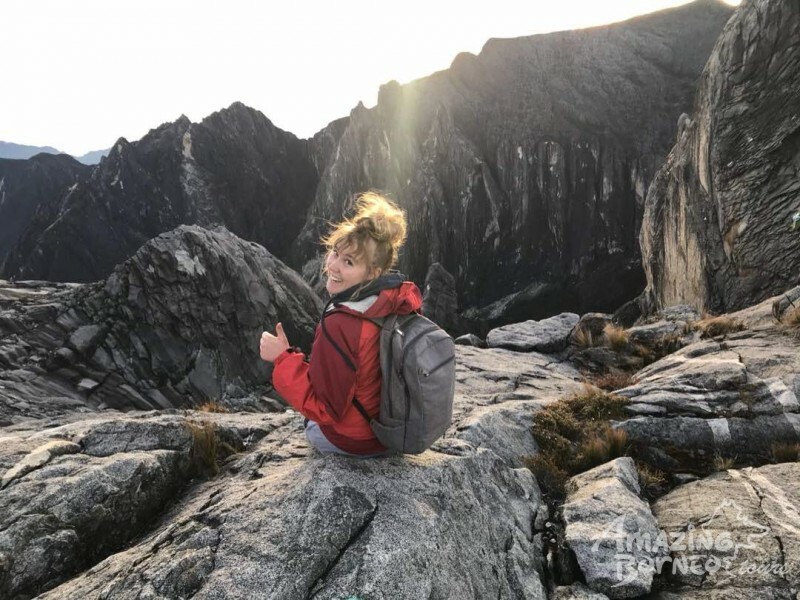 The rules included that one should not be cursing, screaming or shouting at the top of the mountain as the locals in the area believe in respecting the Mountain Spirit(s) that lies within Mount Kinabalu. On a lighter note, did you know that it only took 2 hours and 21 minutes for the winner to complete the Mount Kinabalu Climbathon in 2017? This record is held by Safrey Sumping who also happens to be one of our mountain guides during our trail. Power hikers, climbing the mountain in 2 hours! We could feel the motivation and excitement of every single climber when they finally open the gates leading to the summit trail. "Slow and steady’’ were the keywords given by our guides. The thing I really enjoyed about the #GETLUCKY package, especially as a solo traveller, is that you get to meet new people along the way. Climbing to the top alone can be a real challenge if you’re doing it alone! But when you are in the company of others, you can push and motivate each other, take great pictures, and in my opinion, it’s always more fun sharing this kind of unforgettable experiences with others. The beginning wasn’t all too hard. Comprising of stairs and naturally adapted steps of different heights and sizes, it didn’t make the path too boring or monotonous. The temperature was ideal for a good hike! After every two deep breaths, I would stop to take in the beautiful diversity of plants and trees, and listen to the wild sounds of the creatures in the forest. Different huts were spread along the trail where we would have our little snack and drinking breaks from our packed lunch. The higher we got during climb, the more the huts became something to look forward to. It definitely helps you to keep you going as it acts as mini achievements until the next stop. We are hungry and tired! A small piece of advice, I wouldn’t stop for too long as muscles get sore fast and it takes more energy to warm up and get them active again once you start walking. Some parts of the trail are breathtaking and worth every step. From spots overseeing wide tropical vegetation to Harry Potter misty-looking forests, and never-ending steep, stony paths. Mysterious forest path -- like something out of Harry Potter! We would motivate each other by saying ‘’we are nearly there, only 3km, 2km, 200m left to go… ‘’, each part giving us a new type of scenery for us to discover and distract us from our exhaustion! Even a spot of rain couldn't stop us from getting to our accommodation for the night! How much is there left til the summit? Fun Fact: You will see porters along the way bringing everything to the rest houses! From vegetables to beer, toilet paper, and mattresses. They’ll swoosh past you in such a quick pace carrying probably twice as much as you are! I only have full respect and admiration towards them. We were so happy once we made it to Laban Rata Resthouse! Six hours of nonstop climbing through outstanding landscapes and nature before finally getting to rest our legs. After checking in and a quick shower we got ourselves a well-deserved chocolate bar and a cup of coffee to recuperate. Yeah, finally arrived at Laban Rata! We realised the climb wasn’t over yet and we knew the following day was going to be more endearing. After a short nap, we enjoyed a delicious buffet dinner while watching a beautiful sunset above an endless sea of clouds. We mentally prepared ourselves for the night climb and went to bed. At 2AM, the alarm went off and we took a supper to awaken ourselves and get any extra energy we’ll need for the grand finale!. 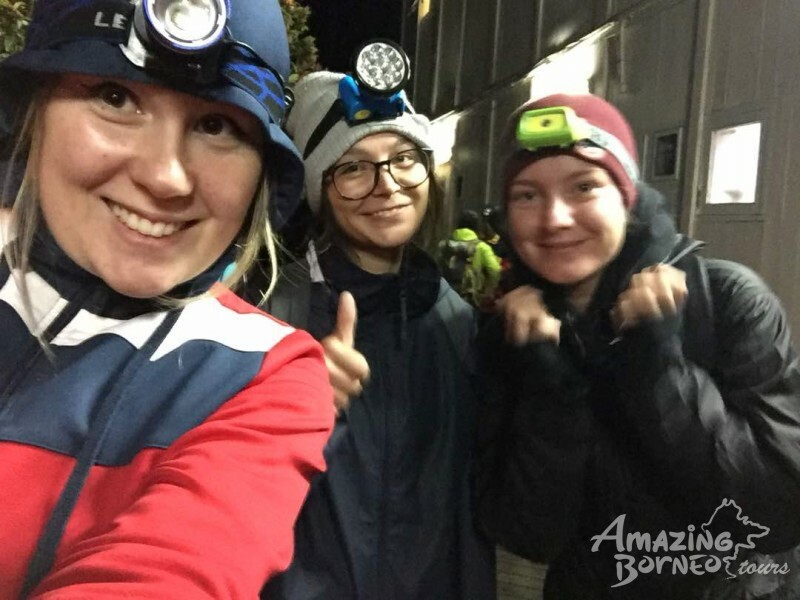 We were told to gather at 2.30AM, so we put our warm clothes on, lit our headlamps, and we were ready to go! We don't look tired at all! This was, without a doubt, the hardest part of the climb. With sore legs fresh from the day before, and it felt as though the uneven steps and stairs just never seemed to stop as each step is got tougher, I ended up asking myself “why am I doing this to myself?”, but mental strength is very much needed to continue on! Little did I know that once we reached the last check point at Sayat Sayat, the climb was only going to be even more challenging. It was steep, muddy, and a bit slippery because of the rain, but the rope was very handy. The peak was so close yet so far at this point! As I stared at the clear milky way above us, I felt my breathing getting heavier and heavier. 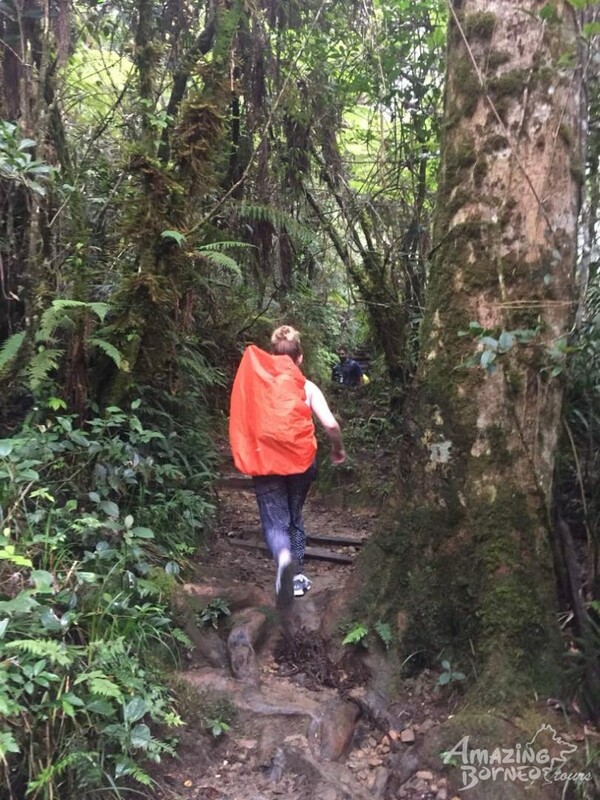 Mount Kinabalu Climb Pro-Tip: try to walk in zigzags as the porters do, it may make the trail longer but it feels less difficult. I could slowly see sunlight coming through the rocks, and that motivated me to make haste if I wanted to reach the summit before the sun would make its grand appearance for the day. Made it just in time for the sunrise! At 6.30AM, just at the crack of dawn, we made it! I’ve never felt so proud that I managed to pull through this! After all that hard work, I was rewarded with such a surreal view making it an unforgettable experience! As the sun continuously rose higher, it revealed to us the famous South Peak and the impressive surrounding granite mountain tops. The mist and clouds would eventually fade away and gave us a perfectly clear view of The Land Below The Wind. We definitely wasted no time in snapping some photos and videos to document this momentous occasion! And after some last Instagram-worthy shots were taken, we began our descent. All OK, just taking a break! Johan, one of the guides offered us an alternative route back to Laban Rata rest house with him. He knew the easiest way down, so we followed him. I barely have any words to describe how impressive it was to walk down facing unreal, picturesque landscapes. Pictures tell more than a thousand words, so the best way for me to describe the view is by showing you. We’re so glad it was a clear day on our way down because we could finally identify the entire trail we took a few hours before. But I’m glad we couldn’t fully make out the trail during our ascend or else I would have probably underestimated my willpower to reach the peak. We had our breakfast before making our way back to the Kinabalu Park Headquarters. Even though you’d definitely need stamina to climb up, the way down felt even longer, and could even be the most challenging part! I take back everything I said earlier about certain checkpoints being tough, getting back to base was definitely a challenge in itself! My sore knees and shaky legs were aching so much, it felt like they were going to give way anytime soon with every step that I took. After 4 hours, we were finally back at Timpohon Gate. Are we back to base yet? Our minds were distracted when a tasty buffet was prepared for us as the Amazing Borneo team handed over our coloured Mount Kinabalu climb certificates! We head back to Kota Kinabalu city with an everlasting memory. 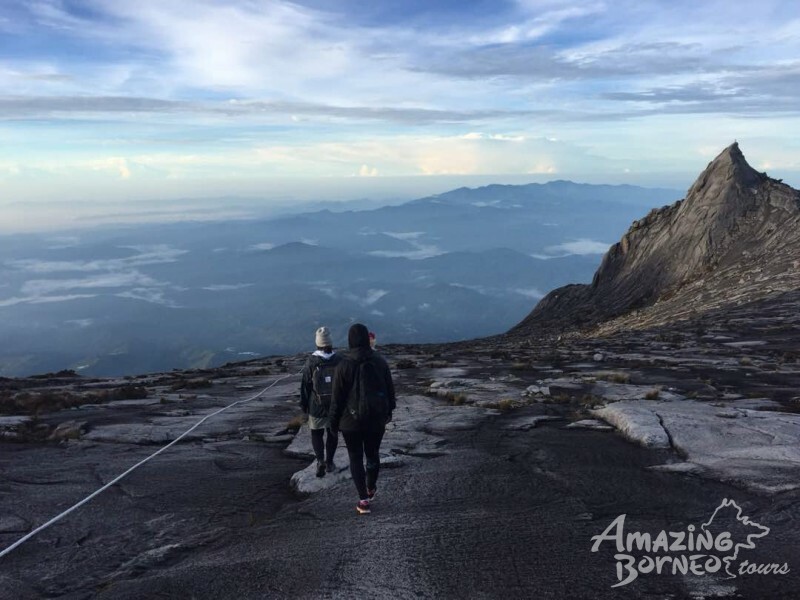 I definitely recommend this mountain climb experience to anyone visiting Sabah! As cliché as this may sound, you only live once! 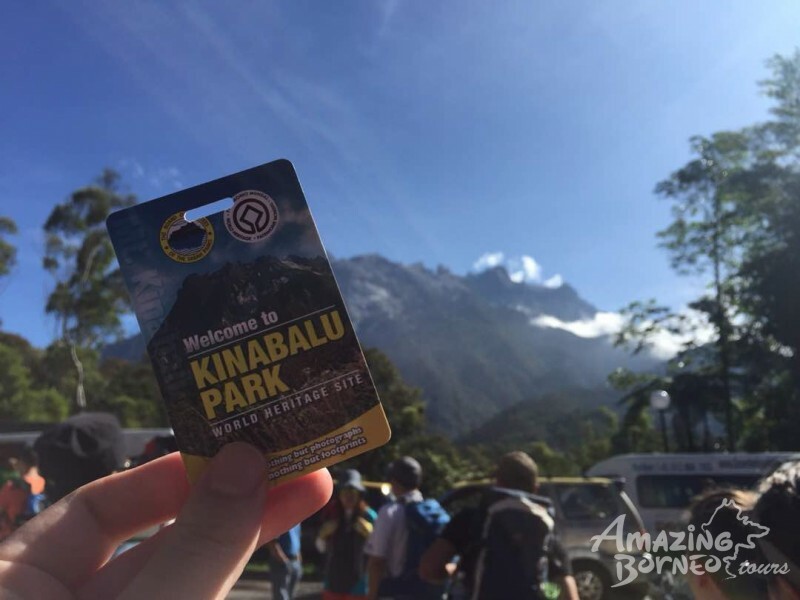 So, head over to Book.MountKinabalu.com and conquer Mount Kinabalu today!